Akershus County Council has adopted a major initiative to facilitate hydrogen cars and buses on the roads in the coming years. A strategy for the early introduction of hydrogen fuel in Akershus and Oslo was adopted by the county council 17 March. The goal is to phase out fossil fuels. In the next four years, the goal is 350 hydrogen vehicles, of which a significant number of taxis, and at least 30 hydrogen buses. Operation and development of a network of hydrogen fueling stations in Oslo and Akershus will be key in this time period. 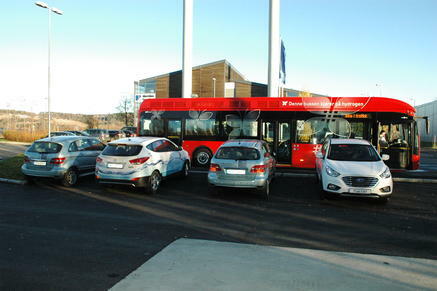 At the end of the strategy period, in 2025, the goal is that one or more hydrogen filling station chains offer at least 10,000 cars and 100 buses. Routes currently has five hydrogen buses in trial operation, and the county council aims to extend this hydrogen bus project. Hydrogen Vehicle has electric motor which only emits water vapor, and are far more energy efficient than the internal combustion engine. The range is that of a corresponding petrol-/diesel model. Hydrogen strategy is common to Oslo and Akershus. The strategy is part of a broader effort to help phase out fossil fuels and towards sustainable transport in Oslo and Akershus. Oslo and Akershus going through the strategy contribute to the development of national and international hydrogen infrastructure.